The British Columbia resort municipality of Whistler boasts breathtaking views, impeccable accommodations, serene hiking trails and many brilliant golf courses. The gorgeous landscape is wrapped in glaciated mountains, azure skies and miles of pristine, untouched wilderness. During the winter, the snowy slopes of the mountain ranges are perfect for skiing and will be hosting the 2010 Winter Olympic Games. In the summer, however, Whistler is known for its other great sport – golf. The Fairmont Chateau Whistler golf course is located in an elegant resort that was voted Canada’s #1 Golf and #1 Ski Resort by readers of Conde Nast Traveler Magazine. This 18-hole, par 72 course is punctuated by granite faces, regal evergreens and flanked by jagged mountain peaks. By staying true to the ruggedness of the surrounding environment, this course provides both a challenge and unique sight-seeing experience. Another popular golf destination is Whistler Golf Club, an Arnold Palmer design. Winding through mountain streams, nine lakes, and highly maintained greens under the purple and blue hues of the Whistler sky will delight the senses of any golfer. 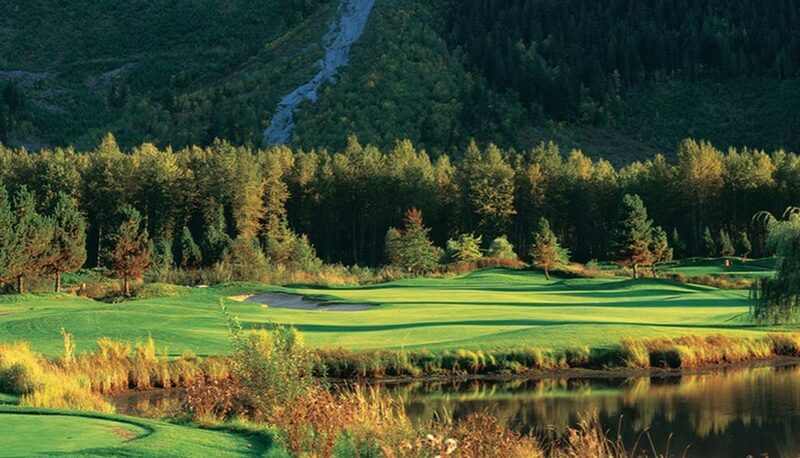 Other highly-regarded and scenic golf courses in Whistler include Big Sky Golf and Country Club, which lies at the base of majestic Mount Currie, and the Nicklaus North Golf Course, an inspired Jack Nicklaus design with a glittering emerald lake. Whistler also offers unparalleled hiking adventures along the Whistler and Cougar Mountains. Be sure to capture the view of the gorgeous panorama atop Piccolo Summit and breathe in the sights as you make your way towards the Symphony Lakes. A fantastic photo opportunity awaits at the rocky shores of the tranquil Cheakamus Lake. Inhale the crisp mountain air and calming pine aroma as you wander through the Interpretative Forest. Other popular activities in the area include mountain biking, canoeing, kayaking, rafting, swimming, nature tours, horseback riding and even bungee jumping. After a long, challenging and exciting day of golfing and hiking, you may be tempted to indulge in a therapeutic massage at a resort spa or relax at one of Whistler’s many fine restaurants. Enjoy a romantic dining experience at La Rua, an intimate restaurant that offers exquisitely-prepared Mediterranean and European cuisine. Perhaps you will choose to ride to the peak of Whistler Mountain on the Whistler Mountain Gondola and dine at one of the mountain-top restaurants. Explore the shopping of Whistler Village, or travel a short distance outside of Whistler to see the thick conifer forests and glaciers of Garibaldi Provincial Park. Other nearby attractions to Whistler include the lively city of Burnaby, the beaches and harbors of the Sunshine Coast, rocking climbing at Squamish, the village of Pemberton, and, of course, the thriving city of Vancouver. With premier golf courses, picturesque views, award-winning accommodations and exciting outdoor activities and attractions, Whistler is sure to be a memorable golf destination for anyone. 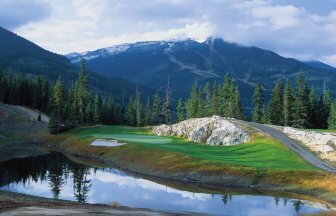 View our Directory of Whistler Golf Courses and Book a Tee Time today!